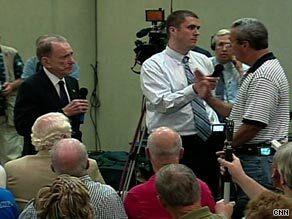 A hostile crowd shouted questions and made angry statements Tuesday at a town hall meeting on health care in Pennsylvania led by Democratic Sen. Arlen Specter. In particular, Republicans and some Democrats reject a government-funded public health insurance option, arguing it would lead to a government takeover of the health care system. Most Democrats want a public option to ensure coverage is available to virtually all Americans and provide competition to private insurers. The Fire This Time: Is This Health Care’s Moment?